The Ontario Government’s Ministry of Labour has ordered that Toronto magazines must stop hiring interns for no pay. The reasons for this may seem obvious: free labour tends to be exploitative even if media organizations claim that there is no intentionality to exploit. And media organizations say that they are giving young people real and valuable experience. Many young people leap at this opportunity. But there is a downside: free labour is not covered by the regulations designed to protect workers. And free labour is not eligible for any compensation in the event of an on-the-job injury. This has caused some media operations in the Toronto area to protest against this government intrusion into their operations. One magazine, The Walrus has had to let go no fewer than eleven (!) interns. Executives will feel their ability to produce a quality product has been severely compromised. Journalism programs at universities and colleges are also put in a complicated situation: part of the allure of a journalism program has always been the promise of an internship or placement arranged by the post-secondary institution. These have usually been unpaid (with some exceptions) but the students receive academic credit for the experience that counts toward their eventual degree. Students are also expected to pay their colleges and universities extra (i.e., beyond their tuition fees) for the privilege of landing a placement. The Ontario Government says will continue to allow universities and colleges to place their students in unpaid internships as long as students are pursuing their degrees. Even as media organizations struggle to monetize their content, the fact that they have been doing it on the backs of young people, desperate to gain a foothold inside a news organization, is nothing short of exploitation. We all want a healthy media ecosystem. But creating a class of digital field hands is wrong and just a form of indentured servitude. At least in sharecropping, there was minimal payment. Many young people find themselves moving from one unpaid gig to another. The result is that only wealthy young people (aka - those who have wealthy parents) can afford these positions. It serves to limit the diversity of young job seekers. And a further unintended consequence of digital media has been, as in the manufacturing business, to drive down wages and prices. As news organizations find themselves in competition with, and imperilled by the digirati, their profits have declined rapidly: Share prices for publicly traded media companies have fallen (with some notable exceptions like Rupert Murdoch’s empires). Profit margins have been drastically reduced especially in the newspaper business. As with manufacturing, media organizations have looked for cheaper ways to produce their content and remain competitive. The automobile industry in North America have relocated to Central America and Asia where labour costs are cheaper. Media industries have also relocated to a “Mexico City of the Mind” (pace Laurence Ferlinghetti) by downsizing and seeking cheaper workers. As senior and more costly journalists have been laid off or bought out, younger journalists have been hired. The Huffington Post may be the most egregious example by tempting writers for no pay at all. The fact that so many young (and some not so young) journalists write for HuffPost is another indication that the plantation mentality exists among media organizations. Now the Government of Ontario has decided that this practice must stop. That is encouraging. Discouraging is that would-be journalists will find themselves back looking for work as baristas. The prospect that some magazines might fold is also sad. But the health of media industries must be based creating great journalism by employing smart journalists who are also paid a decent wage. That should not be too much to ask. "But creating a class of digital field hands is wrong and just a form of indentured servitude. At least in sharecropping, there was minimal payment." Well, Solidarity Forever, Jeffrey. Another view: how do the youngest, least experienced and least valuable to a company get a foot in the door? You can be sure they won't with the loving hand of socialist workers party laws that prevent the newbies from getting a little experience. Putting up barriers to their being exposed to real work in the real world is the least reasonable way to find doorways for would-be entrants to the field. The results are in the news. 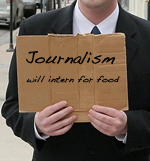 Publishers are closing their intern programs and sending off the interns to nowheresville. A good example of an internship that worked, close to home. My oldest, greatly talented but with no J-School, beat 1,200 applicants to be an intern at his fave magazine in California. 15 years later, he has had a superb career in the world of words, because his free 6 months, some of which were spend sleeping in the back of his truck and couch surfing (despite my offer of help), gave him the opportunity to find a mentor, write some articles and be edited by pros, and get into the rhythm of a magazine publishing cycle. He became a great success. None of that would have been possible without the open door of a tryout. "Conflicted: Unpaid internships are why I have a career. The problem is that they've been grossly abused. The flashpoint came during the great recession when employers relied on legions of unpaid interns to cope with downsizing." Thanks for the opportunity to say it a different way. I agree that a tryout is sometimes a good way to achieve what you want. Unfortunately, and more frequently,it's just exploitation by media organizations that can't figure out how to monetize their product. So they do that with the help of eager kids. Solidarity? Damn right.